As I’ve said in an earlier post, I was asked if I had prepared an account of how I came to join the Bahá’í community. I’ve now completed the story at least in draft. I was planning only to send it quietly to the Bahá’í Histories website and leave it at that, in the hope that very few would read it outside the Bahá’í community. But then I wondered why I should be so quiet about it. Yes, I think it’s a fairly ordinary story about a fairly ordinary person, and to that extent, why go public? But then also it is just about the most important thing that ever happened to me and connects very closely to two of the other most important events in my life. So, I thought, ‘Share it and see what happens.’ It might do some good and probably won’t do any harm. So here goes for Part Three. In the previous part I had just encountered a book that would challenge my atheism so fundamentally it was about to change my life. Not that being godless had worried me consciously. I wanted to look the hard facts of the world full in the face, see reality for what it was without all that smoke-and mirrors stuff. I felt I had found the bed-rock of a firm and true understanding (except I was writing poems about search for reasons I didn’t understand at all). Still, I stuck with my supposedly godless views because I thought they made sense of everything. I didn’t see it as a faith, which it is – just as much a leap in the dark as any other faith might be and ultimately far more unsatisfactory than many others which accept that there is a God. I had simply made a god of nothing since to believe in Nothing is an act of faith. I congratulated myself on the hard-headed no-nonsense courage I was displaying by seeing the world as meaningless. I chuckled appreciatively over Castaneda‘s concept of ‘controlled folly’ in his books about the Yaqui Indian ‘way of the warrior:’ you know the world means nothing but you choose to give it a meaning none the less in a brave act of defiant self-assertion. I plunged into left-wing politics and became ‘a fellow traveller.’ I couldn’t quite make the leap into becoming a real socialist: something held me back. I clearly wanted to find something that would give my life meaning and map out a path of action in the world to change it for the better, but not enough to overcome some sort of reservation. I felt at first the barrier was simply within me. When I began working in mental health and went to see a therapist, we decided that the epitaph engraved in big letters on my tombstone would be, ‘He died with his options open.’ I was very reluctant to make any kind of commitment. Yet at the same time there was this restless seeking after an indefinable something. Because I shared Chekhov’s revulsion from violence and lies I stepped away from the radical socialism I was toying with. Even milder versions that eschewed violence, in my eyes seemed, like everyone else seeking power, far too keen on lies. The ends always justified the meanest means. In some incoherent way I was expressing that I valued truth and compassion more than power, except I could never have put it like that at the time. This drove me to psychology as a way of understanding human nature better and perhaps of being enabled to be of some help sometimes to some people. 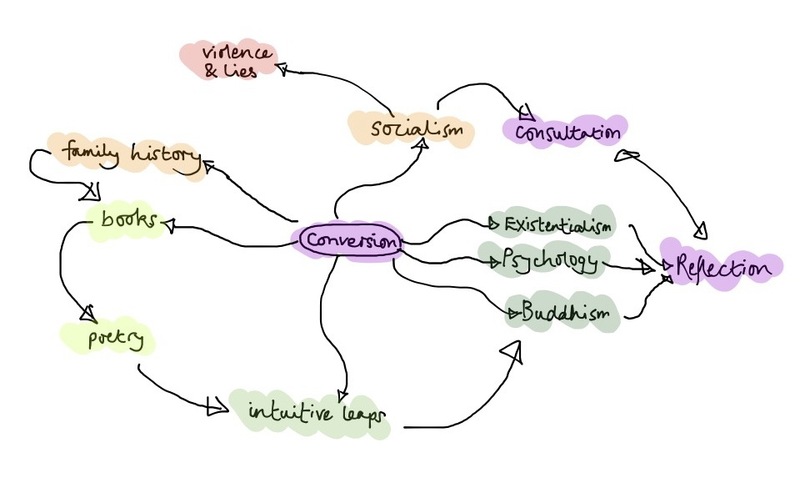 And that led onto Buddhism which seemed a conveniently atheistical religion with a sophisticated psychology. Choosing to investigate that at the same time as I studied psychology was a no-brainer for me. And the meditation I practised as a result was a useful stabilising influence. In the summer of 1982 a few months before my encounter with Robert Scrutton’s book, came my last prolonged exploration of an alternative to religion and spirituality. 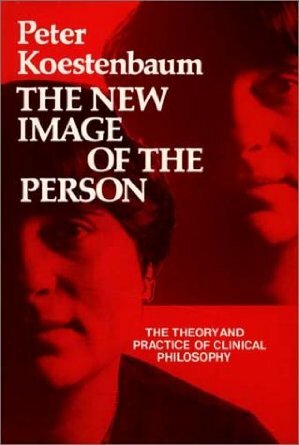 I read a brilliant book on existentialism by Peter Koestenbaum: The New Image of the Person: The Theory and Practice of Clinical Philosophy. It had been published in 1978. By reflection, amongst other things, he means unhooking ourselves from our ideas. But overcoming this resistance is difficult. It hurts and frightens us. How are we to do it? In therapy it is the feeling of trust and safety we develop towards the therapist that helps us begin to let go of maladaptive world views, self-concepts and opinions. With religion of course it is different. I did not realise I was moving towards a faith that does not rely upon a priest to provide the bridge between a believer and a higher power deserving of the trust that will make true reflection at the deepest level possible. This process of reflection, and the detachment it creates and upon which the growth of a deeper capacity to reflect depends, are more a process than an end-state at least in this life. As a process within the individual, it is complemented by and interacts with the process of consultation, which takes place between people and amongst groups and which proved a point of attraction for me in terms of the Bahá’í model of administration right from the start. At last, though I did not know it yet, I had a mind completely prepared for what I was about to find. My debt to Koestenbaum as a writer is very great indeed, overshadowed only by the debt I owe to the writer I was about to encounter within the next few months – in fact, in the book I have just described reading which was having such an overpowering effect. 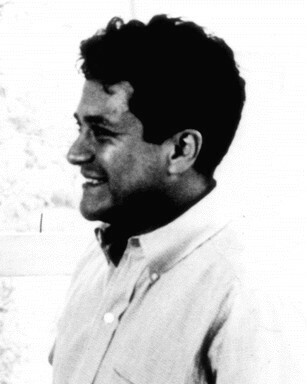 And here I was, sitting on my sofa with the sky darkening outside, wondering whether this had all been made up rather in the way that Carlos Castaneda was thought to have invented his Yaqui Indian. It couldn’t possibly be true, could it? Of course I’d have heard of it already, wouldn’t I? How could I find out? I decided to check the telephone directory. If this faith really existed it must have some contact address. I think part of me felt that I would find nothing, no address, no phone number, no proof of its objective existence. The shock I felt when I found the details for the Bahá’í Centre in Rutland Gate is hard to describe. It was real. It did exist. Now what was I going to do? It was too late to phone that night. And phoning the following day didn’t seem all that sensible. What was I going to say? ‘I’ve just read this book. Can I come and talk to someone?’ That sounded crazy. My days for doing that kind of crackpot thing were long gone: I was a qualified mental health professional now. Nonetheless the following day I made the call and went to the centre on their invitation. The Canadian lady, Bonny, whom I had spoken to on the phone, greeted me cheerfully when I arrived and made me feel very welcome with a cup of tea and the run of the bookshop. 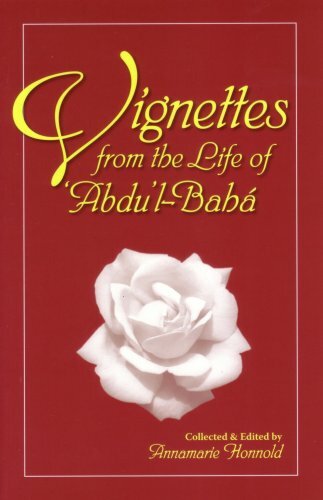 I don’t remember whether I ended up sitting on the sofa next to Annamarie Honnold, whose recently published book Vignettes from the Life of ‘Abdu’l-Bahá I read somewhat later, before or after I bought a carefully selected set of the original Writings of Bahá’u’lláh, ‘Abdu’l-Bahá and Shoghi Effendi. I know that I was determined to read only their own words at this point: I did not want to risk being falsely persuaded by someone else’s plausible take on what they had said. I had made up my mind on two things: to check out whether what Robert Scrutton had written about them was based in the reality of what they had written and said, or sprang only from his own vivid imagination, and to see if anything they had written or said contradicted any of my own most deeply held convictions. If it is unclear in my mind now exactly when I sat beside Annamarie Honnold, I can remember that almost her first words to me were: ‘Possess a pure, kindly and radiant heart, that thine may be a sovereignty ancient, imperishable and everlasting,’ the first of the Arabic Hidden Words of Bahá’u’lláh. I didn’t know at the time how deep an impression that must have made.